Food and energy are the two keystones of any community anywhere on earth. We establish the capacity to create and retain wealth in our community.We put in place the two foundations of any human economy. -- David Yarrow - The Final Word in "Make Smoke, Burn Smoke"
Hopefully most viewing this blog are intimately familiar with the local foods movement. Local food is a logical first step in re-building vibrant local community structures. Small scale seasonal gardens do well enough powered by the summer sun. Year round growing in most climates requires additional energy. As efforts scale up, more energy becomes even more useful. What is the most responsible energy choice to support year round growing? Many rural communities are literally covered with an abundant excess of "stranded energy", energy stranded mostly by perceptions. Missouri, the "Show Me" state, is the historical national leader in the production of charcoal from low value biomass "wastes". An historical truth about charcoal production in Missouri is that smoke covered the countryside when firing up large charcoal kilns. Pioneering research by MIT Phd Chemical Engineer Dr. Tom Reed and world champion clean stove designer Dr. Paul Anderson ("DrTLUD") proves that there is abundant clean energy in "smoke". 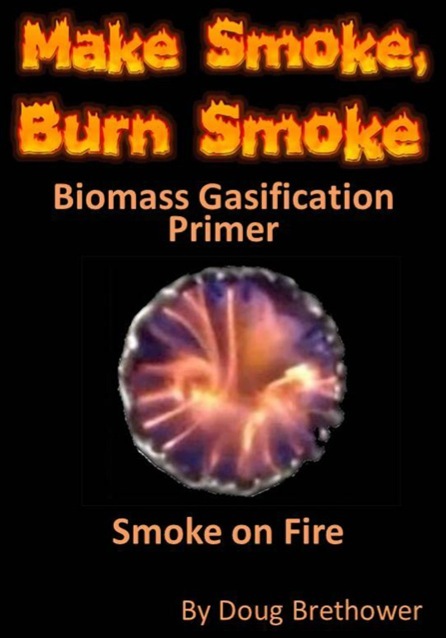 Using the energy in smoke by burning it in a flare, while saving the charcoal - "biochar", for soil improvement is the only energy strategy that actively reduces atmospheric carbon. The more it is practiced, the greater the reduction. While improving the atmosphere, biochar also improves local soils and water quality. Likely due to the simplicity of the technology, there is virtually no corporate or political will to move forward with actually using it. Corporations can't make their standard profit margins. Politicians please patrons by talk of great big things they can do, not little things that everyone can do. The great promise of biomass energy and biochar is not negated by current political and economic realities. But a local fuel requires local involvement for the promise to be brought to fruition. Peaksurfer Albert Bates, author of "The Biochar Solution" says "the technology is already, all ready". There is no more technology to develop, but much awareness to be raised. Author Doug Brethower was raised in the "Show Me" state. After getting lost in the abundance of online information about things like wood burning vehicles and such, he visited with modern day practitioners of clean biomass energy, to discover their truths. "Make Smoke, Burn Smoke" is a compilation of that seeking and personal exploration, what they revealed in personal discussion. The masters often related more useful information in five minute than gathered in years of online exploration. Much information is included to raise awareness of the promise. There are also real world examples of folks who have made biomass/biochar energy work well for their circumstances. A clay biochar kiln, a "grassifier" grass to biochar converter, a continuous feed continuous extract biochar kiln design, an early Wayne Keith vehicle gasifier napkin drawing, much information is included that is difficult to impossible to discover anywhere else. The most gratifying positive responses to the book come from systems engineers, including computer system engineers. Whole systems type of folks, instinctively "get it". Here is hoping you will too.